From the Bonar, Joffre is half an hour’s easy rock scramble up any convenient route. From the head of the Matukituki Valley the South Face of Joffre is more involved than a half hour scramble. From near Scotts Bivvy head up to the face which is on the true right of the Breakaway. A steep spur just to the right of the avalanche gut carved by the Breakaway gives easy access to the face. The first ascent took a line which starts off a large patch of snow under an overhanging wall. Then taking the line of least resistance, climbed on a rising traverse which took in a series of ledges to come out near the top of the true right of the large gully that runs on a diagonal from the base of the face to the summit. There are approximately 10 pitches and, of these, half are good rock. 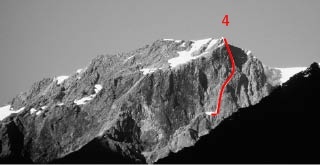 It would be possible to construct a more pleasant line by the use of bolts and taking a more direct line to the summit. After topping out on the first ascent, to a perfect summers evening, the two climbers wandered down the Bonar to Colin Todd Hut in running shoes. Like a couple of street kids they threw themselves on the mercy of the residents and passed a pleasant night with borrowed food and a blanket. Camaraderie and hospitality are still alive and well in the hills—may it always be so. ➠ The slopes above the face are subject to avalanches. Geoff Ellis & Allan Uren, Jan 1999.